Flash mobs are not crimes. They are innocuous, fun events. The only similarity between flash mobs and these crimes is the fact that both can be coordinated using social media. 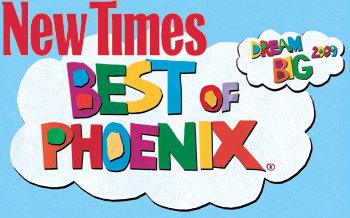 The organizers of Improv Arizona do not condone these criminal behaviors, and we offer our support to the communities dealing with these problems. We are dedicated to keeping our events fun and legal. Before announcing any event, we consider the potential legal implications involved, and select activities that are safe for everyone involved. Our goal is always to entertain and inspire both our participants and the unsuspecting audience. We’re excited to have just finished planning for several new flash mobs for the Phoenix area, and hope to remind people how much fun these things can be! If you want to be a participant in an upcoming flash mob, be sure to follow us on Facebook or join our email list. We will be announcing new events soon. 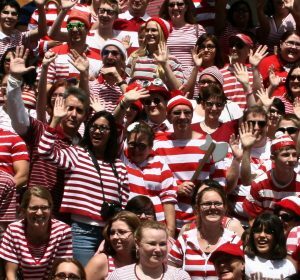 The crew at Improv AZ decided to relive their childhoods and create a living version of Where’s Waldo at Tempe Marketplace. Nearly 100 people donned red and white striped apparel and gathered outside Dave and Busters on Saturday, April 23, 2011. Like the pictures in the Where’s Waldo books, we had one true Waldo in the official Waldo costume, and dozens of red and white lookalikes. The group began to assemble just before 1pm. Security was concerned by the abundance of red and white striped shirts and it took some reassurance from the organizers that it was a short, innocuous prank in order for us to proceed. For about 20 minutes, the group chatted and mingled while stunned shoppers looked on. Many of the onlookers instantly got the joke, while others took some prompting. A few of our cohorts moved through the crowd of onlookers with a flyer showing a picture of our “real” Waldo and asking the strangers if they’d seen our friend. Anyone who didn’t understand what was going on before instantly smiled, giggled, and got the prank. We had all kinds of Waldos – Dog Waldo, Gnome Waldo, Steampunk Waldo, Jester Waldo, Musician Waldos, Baby Waldo, and more! In preparation for this event, many participants flocked to stores in search of red and white striped shirts. One participant said that the clerk at their thrift store remarked that asignificant number of people had come to the store that week on a similar quest. Others opted to make their own shirts by applying red tape to white shirts or vice versa. 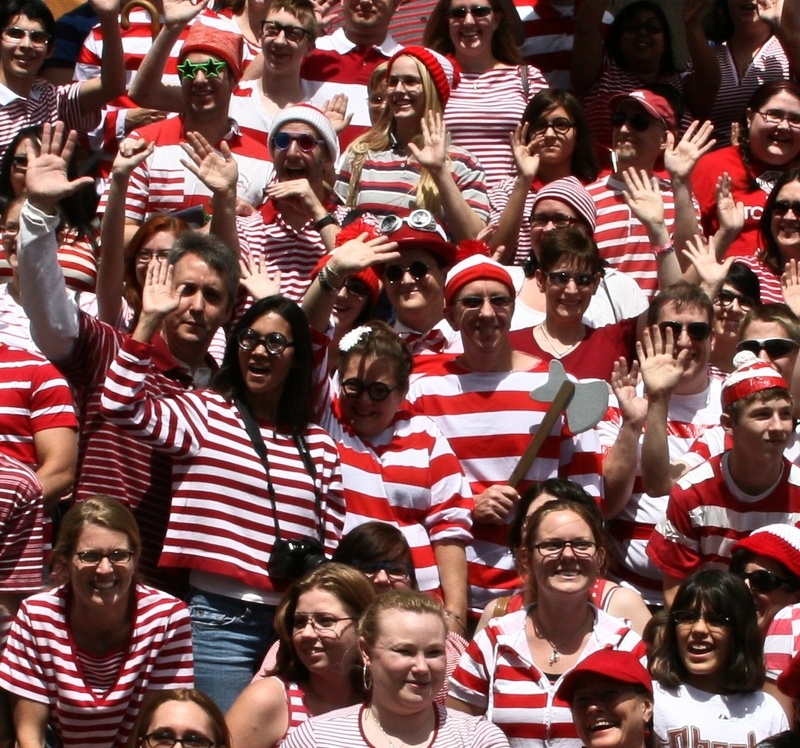 You can check out Flickr to see all the great Where’s Waldo flash mob pictures! Big thanks to everyone who came out, to Sheila Dee Photography for capturing some of the great pictures, and to David and the crew at FlashMobAZ for helping us spread the word! At the end of the prank, we took some group photos and dispersed. Many ventured in to Dave and Busters for a drink or a bite. The wait staff was completely oblivious to what had just transpired outsideand looked bewildered at all the red and white shirts in the dining room. When we explained what occurred, they couldn’t help but laugh. After all, who doesn’t love Waldo? No Pants AZ 2010 Recap: No Trou For You! 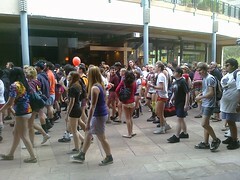 Over 300 people participated in the No Pants 2010 Ride in Phoenix, inciting confusion, shock, and joy in the local community. On Sunday, January 10, 2010, Phoenix was abuzz with Cardinals Football fever as people gathered at light rail stations at the east and west ends of the light rail line. The event leaders, identified by the red scarves tied to their bags inconspicuously navigated the nervous crowds, answering questions and reviewing the action plan. At 2pm, participants began filling the light rail trains. We had so many participants in the east valley that they had to be divided into two trains. Even with the group split up across three trains, there was standing room only in the cars. As the trains began to move, the pants came off. Non-participants reacted first with looks of confusion, which turned into shock often followed by laughter. One onlooker was inspired by the newly pantsless people around him that he removed his jeans as well! At each stop, new people entered the trains and asked us, “Where are your pants?” An older gentleman said he enjoyed the view as he chatted with three cute pantsless women on his way to The Spaghetti Factory. Each pantsless group poured out of the trains in central Phoenix and walked to the Starbucks at Arizona Center. As we walked down the street we were greeted by perplexed looks, car honks, and a few people pulling out their cameras to snap a few shots to show the folks back home. At Starbucks, more people were motivated by our fun and removed their pants. We were there for nearly an hour, talking, laughing, and taking pictures when a security guard approached us and said that we had to put our pants back on. (Note: the Starbucks was next to Hooters where the waitresses were wearing even less than us!) Refusing to comply, we left, either heading back from whence we came, or taking our merriment to the after party at Dave’s Electric Brewpub. Thanks @RailLife for setting it up! As we rode towards the pub, a Metro security guard entered the packed car to check for tickets. He was greeted by chants of “Pants Off!” He laughed and said he felt overdressed. One onlooker turned to Tim, one of our intrepid pantsless leaders, and asked why none of us were wearing pants. Tim responded, “You know, I hadn’t really noticed.” The onlooker immediately pointed to two pantsless ladies – one with undies that said, “Prude” and other’s said, “Geek” – and said, “You’re telling me you didn’t notice this?” Tim could only smile and shrug. While we were relaxing at the pub, a Tempe Police car pulled up and asked if we were the No Pants group. The officer said, “That’s awesome. We had a briefing about you.” We’re not sure if his pun was intentional, but it was beautiful. We asked the local media to not ruin the fun, but some ignored us and spilled the beans. Others were more circumspect and we ended up with a few good mentions around town. The No Pants Light Rail Ride was a huge success. Thanks to everyone who joined us, especially the 40 veterans from last year’s ride. Thanks to nooccar, Nick Bastian, Art Rodriguez, and others we have a lot of great pictures in Flickr. If you add your own please tag them with ‘nopantsaz’ and ‘improvAZ’. We will add pictures to our Facebook group as we can, and you’re welcome to post yours to the event! We hope to post the video on YouTube shortly. No Pants Light Rail Ride 2018 was fantastic! Wow, you really read far down the page! Good for you!